Medicaid Expansion Archives - Read. Think. Act. 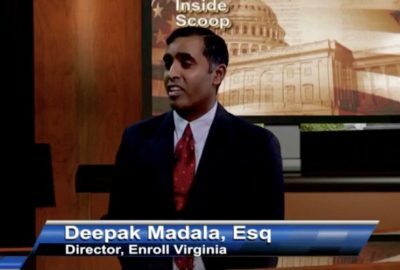 (Nov. 12, 2018) Catherine Read sits down with Deepak Madala, Director of Enroll Virginia, to discuss the process of enrolling Virginians in Medicaid. Enroll Virginia was created by the Virginia Poverty Law Center, and is a non-partisan community based effort to educate all Virginians about the new health insurance marketplace and provide free, unbiased assistance with the application and enrollment process. When the Virginia General Assembly passed Medicaid expansion this year, Virginia became the 33rd state to expand Medicaid through the Affordable Care Act (ACA). Approximately 400,000 Virginians became eligible for benefits. Deepak explains how Enroll Virginia is working hard to reach eligible participants, and get them signed up for health insurance. Madala notes that Virginia has the benefit of learning best practices, and pitfalls, from the states that have already gone through this process. Medicaid is sometimes confused with Medicare. Both Medicaid and Medicare are public health insurance programs but Medicare is administered solely by the federal government and provides coverage for seniors aged 65+, people with disabilities, and those with end stage renal disease. Medicaid (the subject of this show) is a partnership between the federal government and the state governments, designed to provide health insurance coverage for those in poverty. When the ACA passed in 2010, it afforded the states the option of expanding Medicaid with federal dollars for adults aged 19-64 who are considered the “working poor”. Applicants can make up to 400% of the poverty level and still qualify for this program. The state administers and sets guidelines for this program, however it is funded through federal tax dollars. Enroll Virginia is working hard to reach everyone who is eligible for this coverage. They are leveraging partners in the social services arena to spread the word and educate the public. “Train the Trainer” workshops are being scheduled throughout the commonwealth. This is helping to educate social workers and case managers, so they can better understand and communicate eligibility and benefits. Organizations can contact the Virginia Health Care Foundation to register for a SignUpNow workshop. There are no restrictions of who can receive this training; it can be a non-profit, a religious organization or even a business. The rules have changed for the better here in Virginia, and their mission to ensure that the word gets out. For those who are interested in finding out if they are eligible, they can simply call the 1-800 number to speak with a trained representative, go online to do the application or they can mail in a paper copy. The applicants will need to provide information about income, and after that is verified they will know what benefits they are eligible for. If the applicant calls in, and their income can be verified on the spot, then they may not even have a waiting period to know how to proceed. Enrollment for Medicaid is rolling, so there is no deadline to get signed up (as there is in traditional insurance plans). However, the deadline for securing insurance with the ACA State Marketplace is December 15th. So, if an applicant is not sure of whether or not they are eligible for Medicaid Expansion they should contact the office as soon as possible, because if they do not qualify for Medicaid then they have adequate time to secure private insurance by the December 15th deadline. There are six different plan options available to all Virginians, which are different health insurance networks. Coverage is not limited, and there are no premiums, co-pays or deductibles. There is also a specific emphasis on preventative care, things like immunizations and well visits. When choosing a plan, applicants will want to review the various networks to find their current doctors, in order to ensure that they are finding a plan that best meets their needs. Many of the free clinics, where these patients currently seek care, will have counselors on hand to help patients navigate getting signed up for Medicaid and best understand all of the different options. For people who are already receiving certain benefits from the state, such as FAMIS, Virginia’s health insurance program for children, or Supplemental Nutrition Assistance Program (SNAP) benefits, the state has technology in place to assess eligibility for other family members. Recipients should expect to receive a YELLOW envelope in the mail, where they will need to complete a few more pieces of information in order to finalize the application. The goal of the program is to enroll as many eligible participants as possible. If people do not receive this envelope, they should visit the CoverVA website, call 1-855-242-8282, email [email protected], or fill out a paper application at their local social services office to determine eligibility. 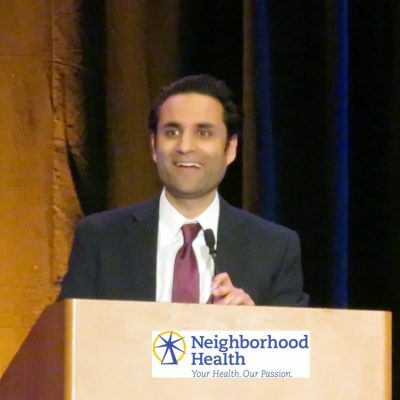 (Feb 19, 2018) Catherine Read talks with Dr. Basim Khan, Executive Director of Neighborhood Health, a Federally Qualified Health Center (FQHC) located in Northern Virginia. Neighborhood Health was started in an apartment complex by nurses from the Alexandria Health Department back in 1997, becoming an FQHC in 2004. In their first year as a clinic, they saw 1,500 patients and in their 20th year they saw 18,000 patients through their 12 clinics located in Alexandria, Arlington and Fairfax County. Neighborhood Health provides an integrated medical home to community residents regardless of their ability to pay. Their goal is high quality healthcare that is affordable and accessible to everyone in the community. Their clinics provide Family Practice/Internal Medicine, Pediatrics, Women’s Health, Behavioral Health Counseling and include health screenings, cancer screenings, on-site lab services, immunizations, mental health screenings, dental services and a pharmacy program. They provide language interpreters (sometimes via phone), offer sliding scales to patients who may have high deductibles for their health insurance plan, and provide medications to patients less expensively than through retail pharmacies. Community health centers provide primary healthcare to over 300,000 people in Virginia and to 27 million patients in the U.S. Providing high quality primary care delivers better health outcomes for patients and helps to drive down overall costs. Dr. Kahn talks about how Neighborhood Health strives to serve as a patient advocate in a really “complicated health system.” In talking about issues of equity and social determinants of health, he points out that our healthcare and social services spending in this country is comparable to other developed nations, but we spend far more on healthcare and far less on social safety net services. Social determinants of health include factors such as education levels, income, the zip codes we live in, the type of housing and employment we have, and our access to adequate healthy food. Working to provide better equity in healthcare outcomes includes Neighborhood Health’s strong partnerships with other local agencies, non-profits and service providers. They work closely with local Community Services Boards to help patients get mental health services and case management when needed. They work with Departments of Health and Human Services that also provide employment assistance, and help with issues of aging and disability. This is the “community” in community health services that treat the whole patient through providing social services that impact health outcomes. Neighborhood Health continues to expand their services, meeting patients where they are in the community. They currently work with Alexandria City Schools to provide dental care to low income students in 8 elementary school through a mobile bus that provides the services right on school grounds. That includes routine cleanings, x-rays, and fillings as needed. Catherine Read pointed out that this is an example of the type of partnership that is at the core of the Community School model – a model of education we don’t currently have in Virginia. Providing needed services to students through the school impacts educational and health outcomes for many students who lack access to things as basic as food, clothing, dental and healthcare, school supplies and tutoring. 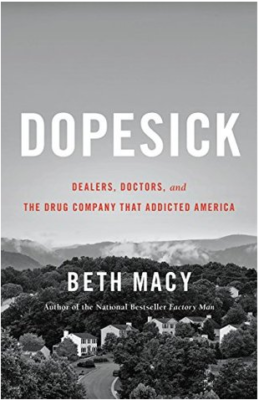 Dr. Khan addresses public health issues such as the opioid crisis and how the trend of medicalizing so many issues has resulted in the over prescribing of pain medications. The epidemic of chronic diseases such as hypertension, diabetes and cancer are tied to social determinants, yet we seem to lack the political will to prioritize key things that need to be addressed, such as affordable housing, which impact health. In the last segment, Medicaid Expansion in Virginia is addressed and what the impact would be on the patients Neighborhood Health serves. The most immediate impact would be the ability to refer patients to local specialists instead of having the University of Virginia as the only option. There are substantive discussions taking place during the 2018 Legislative Session in Richmond that have both parties negotiating terms that now include a “work requirement” proffered by the Trump Administration as an option states can elect to mandate. At the time of broadcast, Medicaid Expansion was still very much up in the air with the future outcome very uncertain. For more information about Neighborhood Health visit www.NeighborhoodHealthVA.org, follow them on Twitter @NeighborhoodHth or on Facebook, or call their main number for assistance at 703-535-5568. 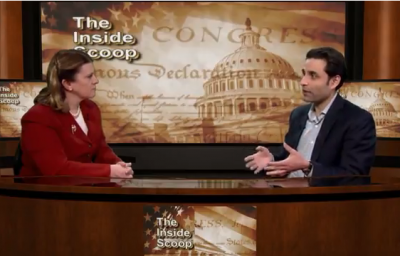 (Jan. 10, 2018) Catherine Read talks with Delegate Marcus Simon (D -53) to get a preview of the 2018 Virginia Legislative Session, which begins on January 10 and will run through March 10. 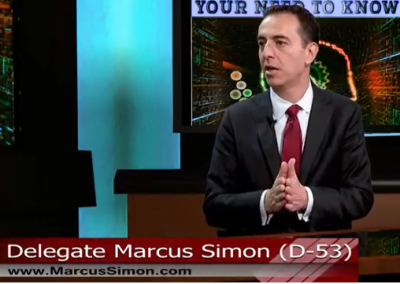 Simon is a Democrat representing Falls Church and surrounding Fairfax County. 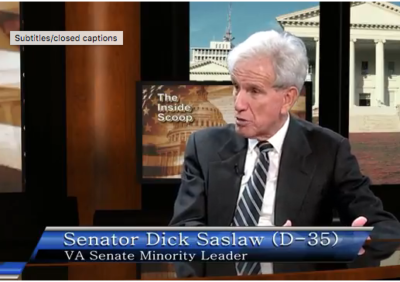 First elected in 2013, he has served on the Militia, Police and Public Safety and Science and Technology committees throughout his tenure as delegate. 2017 saw a blue wave wash over the commonwealth, as 15 new Democratic seats were picked up bringing the House to a 49-51 split. 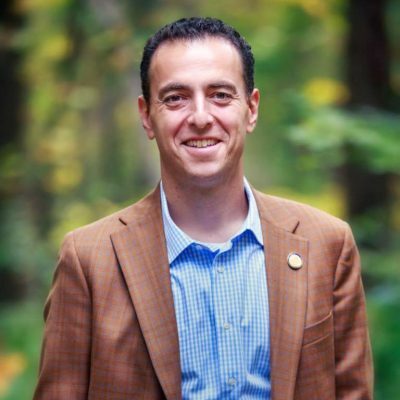 Simon is excited about the energy and enthusiasm that the freshman delegates will bring to Richmond, as the change in the makeup of the General Assembly has the opportunity to open up a world of possibilities that did not exist in previous years when the Republicans held a 2/3 majority in the House. This freshman class of delegates will face a steep learning curve, and the caucus will be faced with the challenge of having a third of its members being brand new to the body. In order to get in front of this, Delegate Simon shared that the new delegates were first brought down to Richmond in November to get an early orientation and “boot camp” introduction to the legislative process, learning everything from parliamentary procedure to how to file a bill in the system. Each new delegate was paired with a mentor to help them navigate the system, and be available for questions on a variety of issues. His advice to the new delegates: focus on a few core issues that they would like to advance in order to help craft realistic public policy. If they are able to concentrate on deliverable issues, then they will have concrete steps to stand on when they go back home to their districts. Activists in Virginia were ready to get to work after the devastating loss in November of 2016 that gave Donald Trump and Republicans complete control of the Federal government. Grassroots organizers came together in unprecedented numbers to help turn the tide in the commonwealth. Spawning groups like Network Nova , Indivisible, and Postscards4VA , Simon hopes that the energy and enthusiasm that went into canvassing, phone banking and postcard writing during the elections can now be turned into advocacy to help advance issues that are near and dear to their hearts. He indicates that it is important for the people who helped create this blue wave to get involved in the legislative process, and hold the people who they elected accountable. 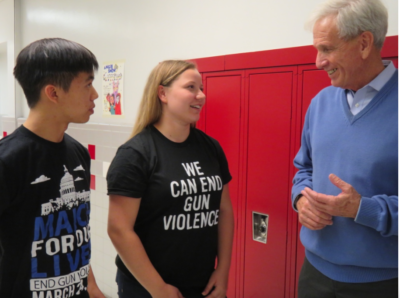 With Virginia having a part time legislature, the window of opportunity to get things done is short, and targeted advocacy on specific state issues can have a great impact. The first step in being able to hold elected officials accountable is to understand how a bill becomes a law in Virginia. Once they know which legislator will be carrying a specific bill, they can then learn which committee will be hearing the bill. All of the bills and legislator information can be tracked on the Virginia General Assembly website. Specifically, the Legislative Information System will show progress of bills as they move through the legislative process. Committees are really where most of the heavy lifting occurs. Witnesses are invited to come testify, and committees debate the merits of the bill. As an activist, it is important to know which legislators sit on which committees, and it is important to communicate opinions on specific pieces of legislation. Every communication with a legislator will get tracked and recorded, then reflected on when it is time to vote. The more constituents a legislator hears from, the more seriously they will take a bill. Activists can also make appointments to individually meet with the legislators, participate in “Lobby Days”, when specific groups descend on Richmond to demonstrate and meet with legislators, and share information on social media platforms. Finally, when asked about Medicaid expansion Simon felt very positive. 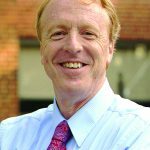 As a signature issue of outgoing Governor Terry McAuliffe, as well as a campaign promise of incoming Governor Dr. Ralph Northam, Simon believes that there will be a real opportunity to deliver healthcare to hundreds of thousands of Virginians. With hard work and compromise between the two parties, Del. Simon thinks that they will come to a “yes” in order to take advantage of the 6 million dollars a day that the commonwealth is giving up by not accepting the federal Medicaid expansion program. 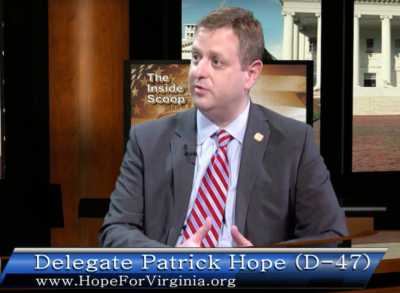 (Dec. 4, 2017) Catherine Read interviews State Senator George Barker (D-39) to discuss Healthcare in Virginia. 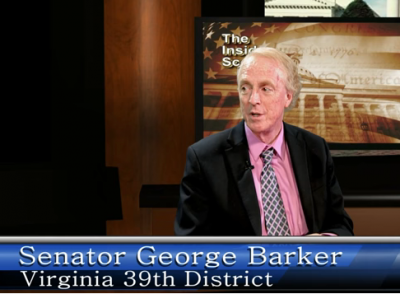 Sen. Barker represents the 39th District, which includes southern Fairfax County and parts of Prince William County and the City of Alexandria. His academic credentials include an undergraduate honors degree in Economics and Public Health, along with a Masters degree in Public Health Policy and Management, both from Harvard University. For 30 years, Sen. Barker has worked for Northern Virginia’s regional health planning agency, the Health Systems Agency of Northern Virginia. He has worked hard to contain skyrocketing health care costs, promote quality of care and ensure access to medical care for all Northern Virginians. He spoke today about the current state of healthcare and how we can best move forward to serve all Virginians, along with the importance of expanding Medicaid in Virginia. Sen. Barker first gives an overview of how healthcare is delivered to the most needy in our community. In the 1980’s, Fairfax County was visionary in how it established Community Health Care Network to deliver care to the uninsured (although the centers do take insurance and Medicaid payments if patients have coverage). Officials recognized the importance of treating people for day-to-day illnesses and preventative care, so that trips to the Emergency Rooms could be minimized and costs could be kept down. During George W. Bush’s administration, there was bipartisan support for a similar federal model to be employed. When a new system was established, Fairfax County was able to take advantage of federal dollars to support their ever-growing operations. Fairfax County now contracts with INOVA and has three centers located in South County, Merrifield and Reston designed to serve people who make up to 200% of the poverty limit. Alexandria, Arlington and Prince William also have also employed a similar free clinic model. One of the challenges faced by patients is that the clinics can be located far away from their homes, and the trip could be difficult or expensive. Additionally, many people do not even know that these centers exist to serve them. If the General Assembly were to expand Medicaid, these centers would not be so over-burdened, as many would opt for covered care closer to home. 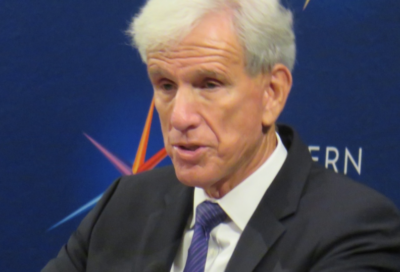 When pressed about how Virginia stacks up to other states, Sen. Barker said that Virginia is consistently ranked as of the best and most efficient Medicaid programs in the country. They have been inventive, creative and out front in supporting programs that create incentives for people to do the right thing. He notes that the state is, however, quite frugal. The reimbursement rates lag behind others, as Virginia does not reimburse doctors at competitive rates. This is challenging because fewer doctors are then opting to accept Medicaid payments. 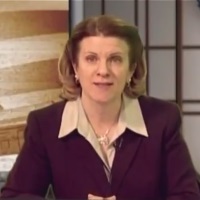 In the final segment of the show Catherine discusses the Affordable Care Act with Sen. Barker. Looking back to 2010, President Obama used a very Republican framework for creating the ACA. It was modeled after the Massachusetts healthcare system implemented by then Governor Mitt Romney. The main goal was to target the uninsured and to address rising costs. At the time the US was spending 20% of its GDP on healthcare. No other advanced western nation spends more than 13% of their GDP. Although vehemently opposed by the GOP controlled Congress, Sen. Barker shared that the result has been that more people are insured, it has helped decrease the deficit, expenditures have been less than projected and the revenues that support the expenditures have been higher than expected. In order for the ACA to work properly, the idea is that everyone needs to be insured so that there is a large, divese “pool” of people paying into the system. This spreads out the risk amongst all people, and allows insurance companies to take on the risk of covering all patients, even those with illness and preexisting conditions. Unfortunately, the recent tax bill passed by Congress has taken away the penalty for the individual mandate. This basically tells young, healthy people that you do not have to seek coverage – just wait until you are older and need insurance. Sen. Barker’s estimate is that 13 million people will lose their coverage under this scheme. Looking ahead to 2018, Sen. Barker is encouraged by the prospect of expanding Medicaid in Virginia. Back in 2014, when states became eligible to participate in the federally subsidized program, the Virginia General Assembly opted to not take the federal dollars to expand the program. Hundreds of thousands of Virginians continue to go uninsured because they make too much money to qualify for Medicaid, but do not make enough money to afford insurance on the exchange. In past years, both the Governor and the Senate have favored opting into the federal program, but the House has flat out rejected it. With the new makeup of the House of Delegates this year (Democrats picked up 15 new seats in this past election) Sen. Barker indicates that there is real hope of getting this passed. Although Medicaid has failed over the past 4 sessions, Sen. Barker did want to point out that there have been some advances and new initiatives in covered services. As far as mental health and behavioral health is concerned, people who previously did not qualify for benefits can now access them, and don’t necessarily need to wait to qualify. This helps to get people what they need when they need it, before it become a crisis situation where they can harm themselves or others. Additionally, the ARTS (Addiction Rehabilitation Treatment Services) was established. This progam is targeted to those suffering from substance abuse, so that treatment is more readily available and less expensive. The success of these programs, according to Sen. Barker, justifies moving ahead with Medicaid expansion. Since this interview aired, the General Assembly has proposed the biennial budget for 2018-2020. The House budget did include Medicaid expansion, however the Senate budget did not include the program. The budget conferees are currently negotiating the status. The GA session ends on March 10, and they hope to have things resolved so the budget can be passed and sent on to the Governor.